I saw XOLO Q2500 and I found that the device is MediaTek MT6582 based and at that moment I opened my blog and started writing guide to root it. I am first to post this guide, but I am sure this guide will work with XOLO Q2500 because I have rooted my friend's MT6582 device once. Just some simple steps and you are rooted. Xolo has just launched XOLO Q2500 in their smartphone list, I mean the device is available now. It has 6 inch touch screen with Android 4.2.2 OS installed in it which is old now days. The device has an HD touchscreen 1280×720 pixels display with 241 ppi density. The device is boosted by MediaTek MT6582 Quad-Core SoC (System on Chip) which is supported by Mali 400 GPU MP2. Because it is SoC, the device is low-budgeted else, it would be above 20 thousands. The phone flauts it's 1 GB RAM and 4 GB internal storage which can be further expanded up to 32 GB by using external sd card. The XOLO Q2500 supports an 8 Mega Pixels (rear) camera which can record videos up to 1080p (feature of MTK MT6582 SoC), Panaroma, HDR etc. and has a 2 Mega Pixels (front) camera which can also record HD videos. It is powered by 3,000 mAh battery which should give at least 15 hours of talktime and 600 hours of standby, but we all know it's just a dream what companies claims. It has Dual-SIM, supports 2G, 3G, WiFi, YGPS and other connectivity options. I am actually excited to show you the rooting of XOLO Q2500. Let's begin! Read me before you may scroll down..
MXRootROM and/or the writer is not responsible for bricking device after rooting! No one has bricked his/her device while rooting, but some people try to do different things before they make a backup, so after rooting, please make a backup with MTK Droid root & tools. Then you may do anything at your risk. XOLO Q2500 charged up to 70% before you try to root! 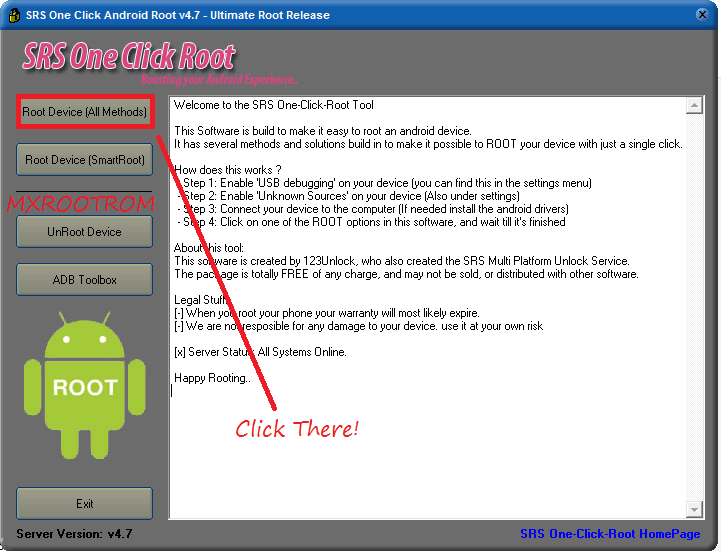 SRS One Click Root: Download it from Samsung Galaxy Talk. Nothing else, but just some chips to relax! Install the tool. Then close the app. There will be options to minimize or exit. Click on Exit if you don't want to use it. Then install SRS One Click Root in your Windows PC. Click on Root Devices (All Methods) options to root your XOLO Q2500. It will automatically reboot your device. After rooting, backup your device with MTK Droid Root and Tools to restore it even in hard bricks! I hope you rooted your XOLO Q2500. You may upload your recovery image here so I can make ClockWorkMod recovery for XOLO Q2500. Enjoy your rooted XOLO Q2500!